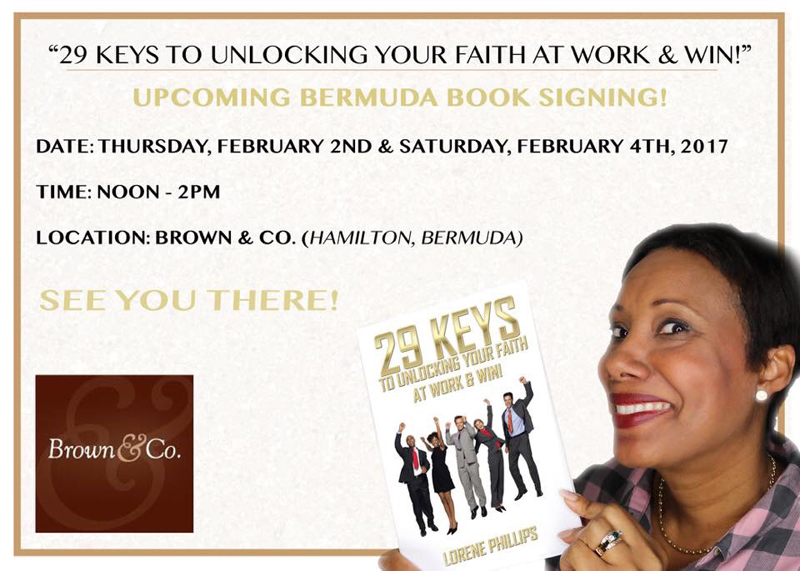 Lorene Phillips, author of the book “29 Keys to Unlocking Your Faith at Work & Win!,” will be available to sign books on Thursday, February 2 and Saturday, February 4 from 12.00pm to 2.00pm at Brown & Co in Hamilton. Ms. Phillips’ book promises to “help readers use their faith in the workplace to their advantage” and is available at Amazon and Barnes & Noble. A spokesperson said, “In ’29 Keys to Unlocking your Faith at Work & Win!,’ Phillips shows readers how faith can bring a purpose to their work by raising their level of performance. God has no place in the workplace. Keep your fairy stories at home and stop trying to shove your beliefs down peoples throats. Having read this book it is incredibly insightful and extremely informative. We need more books like this in the marketplace. This is a great read for anyone just starting their career.